A powerful, versatile online store for any business. BitPay works directly with Shopify to integrate bitcoin payments directly into Shopify's hosted checkout system. Enabling bitcoin payments in your shopify store is simple and requires no coding knowledge. You can get started by following the instructions below. 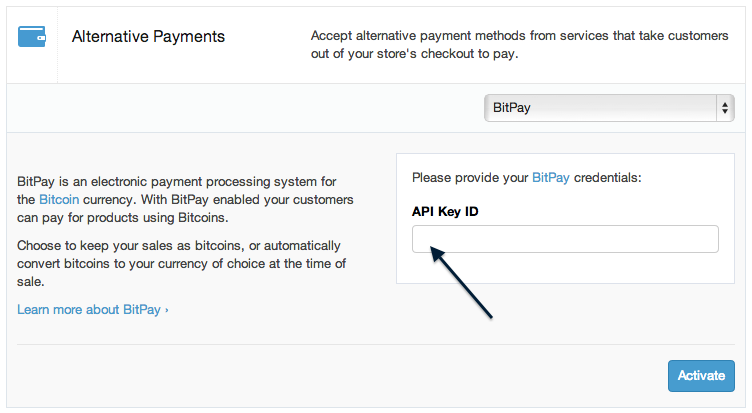 To create a new BitPay API key, log in to your BitPay account. Once you're logged in, visit your API Key settings, available under Payment Tools > Legacy API Keys. If you don't already have an API key, create a new key by choosing Add New API Key. You will need the API Key ID (a string of 42 letters and numbers) in the next step. For your records, you may choose to add 'Shopify' in the Memo field of your new API Keyby clicking the Edit button. To turn on bitcoin payments in Shopify, log into your shopify account and visit the Settings section from the left sidebar. In Settings, choose Payments from the new left sidebar. In the Accept Payments section, open the Select an Additional Payment Methoddropdown from the Alternative Payments area. Select BitPay from the list. In the API Key ID field that appears, paste in your API Key created in the previous step. You can now choose Activate to begin accepting bitcoin payments immediately.